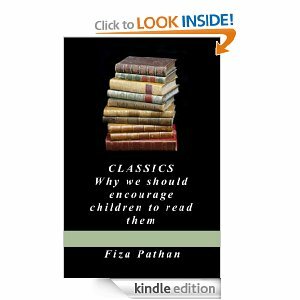 My new book “CLASSICS: Why we should encourage children to read them” has just been published and is available for download on Amazon (Kindle version) and in Paperback. Book bio: With the aid of this small book, I want to propagate the importance of classics to everyone, every student, parent and teacher. I know my compendium is small, but it’s a beginning.Through this book I shall introduce to you the various classics that have influenced me, the different skills one can develop by reading good literature and how sometimes good fiction makes reality a lot more tolerable. It was a real pleasure to read Fiza Pathan’s book. She is enthusiastic about this topic and with good reason, as the success of her students show. Teacher colleagues have the benefit to use her techniques for stimulation of their English classes. Good initiative to encourage children to read classics .. This is great! I am glad to see someone address this. I was reading to my children every night all the way through their High School years. They really enjoyed it. They are adults now with kids of their own and take them to the library and read to them all of the time. The grandchildren are very creative and have vivid imaginations 🙂 It makes me happy!